CHINA is one of the world’s largest providers of foreign aid. But it has a reputation as a rogue donor: stories abound of shoddy projects, low environmental standards and mistreatment of workers. A hospital built by the Chinese in Luanda, the capital of Angola, developed alarming cracks and had to be rebuilt. Aid is widely thought to have been diverted for arms purchases by Robert Mugabe’s regime in Zimbabwe. The list goes grimly on. Stories do not abound, however, about who gets China’s aid and what it goes on. The government says that it spends about $5bn a year on assistance to other countries. But it has no aid ministry comparable to, say, Britain’s Department for International Development. Most details of the aid programme are kept secret, perhaps because the largesse is unpopular domestically. Many Chinese think that their country is too poor to give handouts and the money ought to be spent at home. When the health ministry tried to investigate whether Chinese projects in Africa made people healthier, the rest of the government flatly refused to co-operate. The most detailed study so far of Chinese aid, published this week by AidData, a research group at the College of William and Mary in Virginia, shines a light on the murky data. The report looks at 4,400 projects which China has either committed to, is building or has finished, between 2000 and 2014. It finds that the country gave or lent about $350bn over that period—not much less than the total of American aid, which was $424bn in those years. 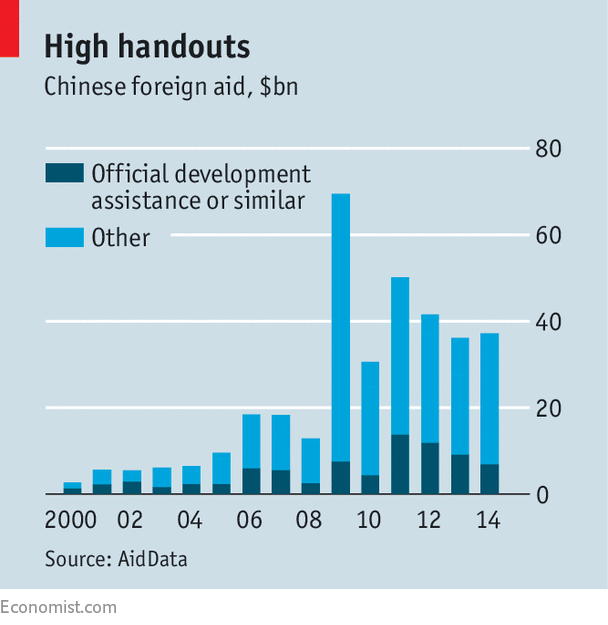 But almost all of America’s aid is in the form of grants, compared with a fifth of China’s. The rest is concessional lending at below-market interest rates, mostly to Chinese companies working abroad—the kind of aid that used to be common in the West but went out of fashion in the 1990s because it overburdened recipients with debt. The grant component of China’s aid was $75bn, still a lot (about the same as Britain’s), but not a tidal wave of money. 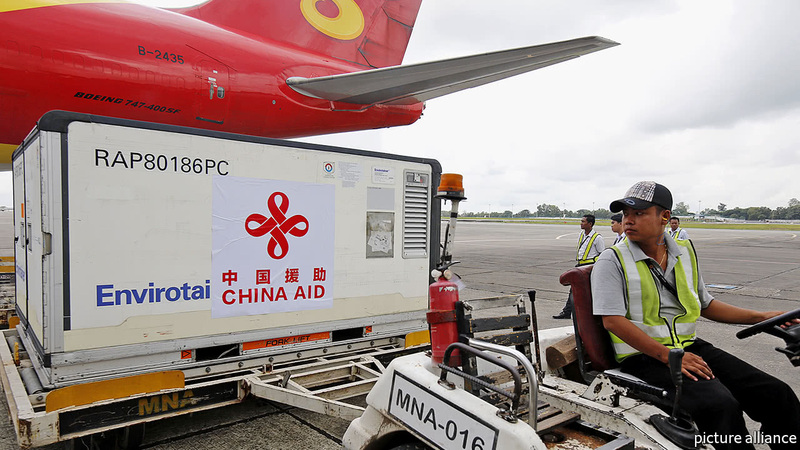 Previous AidData studies of Chinese aid have been controversial. In 2013 the researchers reckoned that aid to Africa alone (which accounts for half of China’s total foreign aid) was $75bn between 2000 and 2011. Deborah Brautigam of Johns Hopkins University in Maryland said their calculation was “way off”. She criticised what she described as its excessive reliance on unreliable news reports. AidData’s new estimate appears to be better grounded. It is based more on official announcements from Chinese commercial offices abroad and from the finance and planning ministries of recipient countries. The authors use their new numbers to look at whether Chinese aid works—an equally controversial subject. In a study published along with the data set, researchers including Bradley Parks of the College of William and Mary find that the grant kind does. They reckon a doubling of Chinese grant aid is associated with a 0.4-point increase in the rate of GDP growth of the recipients after two years. That is more than can be said for China’s no-strings-attached concessional lending, which, according to AidData, has no effect on the receiving country’s GDP. It appears to be tantamount to an export subsidy to Chinese firms, with a side order of backhanders for local elites. On a happier note, the study looks at whether Chinese aid damages Western assistance. The researchers do this by calculating whether aid effectiveness declines in countries that receive Western aid and then get an influx of Chinese cash. It finds no decline, implying Chinese aid does not harm efforts by other donors. Three conclusions can be drawn from AidData’s findings. First, Chinese aid could do more good in poor countries if more of it came in the form of grants, rather than cheap loans. Next, Western aid agencies should not be so wary of co-operating with the Chinese. Co-ordination is important in aid-giving because otherwise you might find, say, three aid agencies each building a hospital in the same city. Because China is regarded as a rogue, it is not roped into the co-ordination efforts among Western donors. That should change. Lastly, the paucity of information about China’s aid (despite AidData’s efforts) is caused by the opacity of China’s government. Perhaps it might consider being more open about a programme that appears, for all its flaws, to be moderately effective. Aid given/received between countries is a very complex issue to understand! The above news piece is interesting and informative to me, as I never thought that lending the money at a favourable interest rates is considered as Aid not Loan. Perhaps I am a simple man, and take things by word meaning.